San Shou and Street Survival - San Shou & Street Survival are taught back to back. Students to learn the sport aspects and real life combat. San Shou (free fighting) / Kick Boxing is an explosive hand-to-hand combat sport. 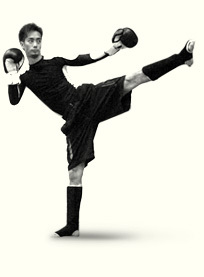 Techniques are based on scientific one-on-one efficiency including strikes and takedowns. Street Survival provides you with the skills to handle yourself in extreme scenarios in which emergency self-defence is required. Training includes knife fighting, group fights, and self-defence mentality.